Road Trip 2009 The end. Some people will ask,"What did you do on your trip besides ride your motorcycle, eat food and sleep?" My answer "Ride Eat Sleep Repeat, what else is there?." 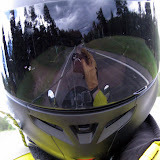 It's not easily explained to non-motorcyclist, but motorcyclist know what I mean. burned 73 gallons of premium gas. crossed the Continental Divide 6 times. rode over 17 mountain passe's. 11 of 17 passe's over 10,000 feet. 2 of 11 over 12,000 feet. rode to an altitude of 14,110 feet. visited 5 ghost towns / mines. rode the Bus 4 times. picked up my bike 2 times. crashed 1 time, going backwards no-less. Copper Kitchen in La Junta, CO.
Feliciano's Home Run Pizza in Chama, NM. Francisco's Restaurante Y Cantina in Durango, CO.
Ted's Taco in Mancos, CO.
Serious Texas BBQ in Durango, CO.
Mario's Pizzeria & Ristorante in Gunnison, CO.
Taco John's in Goodland, KS. father and sons in La Junta, CO.
Wisconsin Bikers in Raton, NM. Colin (from Farmington, NM) in Mancos, CO.
Everyone at Basin Motor Works in Mancos, CO. Bus driver in Durango, CO.
Hotel clerk in Gunnison, CO.
Truck driver in Goodland, KS. I also learned a few things. It seems I always learn a few things on trips like this, but soon after I'm home I forget much of what was learned. Maybe by committing it to digital paper I will retain more of it. I need to pack lighter! Interestingly enough I have consistently packed lighter over the years, but I still need work. I have two area's in particular that I need to improve. The first is photography / electronics gear. I have slowly decreased the amount of photo gear I take along on my moto trips, and I believe on my next trip I can manage with even less. In the past computers weren't a problem, but today every body has a laptop and they will fit on the bike easily. The computer is a great to have along, but it does add a significant amount of weight, unless you have the latest MAC Air book, which I don't. I believe a net-book is warranted before the next Moto trip. My second problem area is Fix & Repair. Do I need to drag an air compressor, slime, plug kit and a second set of tools? Well yes, or well maybe and in fact I would like to add a liter of gas to my kit (more weight to lose elsewhere). I guess it depends on where my travels will take me. I will work on lightning the this part of the load before the next trip. Lastly I have learned that if I plan on exploring the southwest in the future and in particular search out ghost towns, I need to acquire a smaller and lighter motorcycle. Even before I was home my mind was spinning about new wheels. BMW, Kawasaki, Suzuki, KTM and Yamaha. New or Used. More Street or more Dirt. So many choices, I will pursue this in more detail in a future post. The one thing that is certain is that I have only scratched the surface of the great motorcycle roads and that I must return. The only question is when. Who is the Scoot'n Art? The crap that takes up all my time. TheScooterScoop | America's motor scooter, moped and micro car news source.